Teens at a Stan State agriculture careers camp learned how it can feel to walk in a diabetic’s shoes. Goggles fuzzed their vision, pebbles vexed their feet and a breath-hampering mask gave them a sense of being winded easily. Meal choices change lives, nutritionists explained while giving students the memorable introduction to diet-linked professions. In a week devoted to career paths in the food and agriculture industry, few participants had considered a future based on the food rather than the farm. That mental stretch is exactly what the Summer LEADS Program aims to provide, said Oluwarotimi Odeh, head of the Stan State agriculture  program and a professor of agricultural economics. 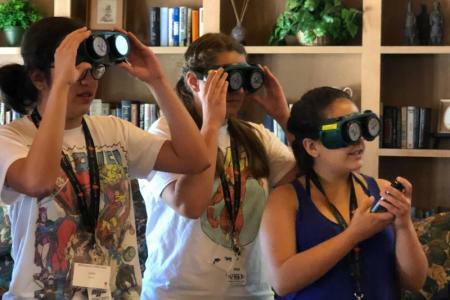 A grant from two federal food and agriculture agencies funded the LEADS (Leadership Experiences in Agricultural Development and Sciences) camps held in June. This marks the third consecutive year of the annual camp, which exposes participants to several college majors and various related careers. “It’s an opportunity to show students the different parts of the food and agriculture industry and let them experience a variety of career paths,” Odeh said. Many students come into ag classes with a general sense of liking the outdoors or focused on a single job they know. “This experience lets them speak to people in the field — genetics, research, animal science, plant science, pest management, agribusiness — and get a better understanding about what those jobs entail,” he said. The 2018 summer program added more interactive activities in response to student feedback, said camp coordinator Katherine Fraser, a recent grad in agriculture. “It’s more hands-on, with fewer lectures,” she said. The Fresno State Food and Nutrition presentation on nutrition came on day three of both week-long camps, with the first week aimed primarily at high schoolers and the second week geared for junior college students. “Our primary focus is on reducing and preventing obesity,” said nutritionist Noemi Jimenez as she encouraged students to load up at a lesson-linked salad bar. The healthy snack was served after the teens used their height, weight, heart rate and blood pressure measurements to create a basic health chart with Body Mass Index (BMI). Patterson High graduate Gisell Ruelas will be entering Stan State this fall, planning to major in agriculture and become a USDA consumer safety inspector or ag teacher. Beside her, Merced High seniors Melissa Rios and Elizabeth Contreras said they are looking at agriculture economics with any eye toward ag businesses or import-export markets. All three said the camp gave them a way to get to know the University, as well as ag occupations. High school sophomore Victor Wall of Atlanta, Ga., found the Stan State program online as he explored potential careers in agriculture and food industries. He traveled to the camp because he wanted to see the career options available in agriculture. “I like that they’ve introduced us to a lot of the technology aspects of ag,” Wall said. For the 20 or so students at each camp, a key benefit is seeing the breadth of the multi-disciplinary agriculture program at Stan State, said Alejandra Pulido, a Stan State senior in ag economics who came to the 2016 summer LEADS program while still a Merced College student. “For me, the most helpful thing was getting to know students in the program and getting to know the program,” she said.